Definition at line 22 of file RISCVInstPrinter.h. Definition at line 24 of file RISCVInstPrinter.h. References getRegisterName(), MI, llvm::RISCVFenceField::O, printAliasInstr(), printCSRSystemRegister(), printCustomAliasOperand(), printFenceArg(), printFRMArg(), printInst(), printInstruction(), printOperand(), and printRegName(). Referenced by printRegName(), and RISCVInstPrinter(). Referenced by printInst(), and RISCVInstPrinter(). Definition at line 80 of file RISCVInstPrinter.cpp. References llvm::MCSubtargetInfo::getFeatureBits(), llvm::MCOperand::getImm(), llvm::MCInst::getOperand(), and llvm::AArch64SysReg::lookupSysRegByEncoding(). Definition at line 91 of file RISCVInstPrinter.cpp. References assert(), llvm::MCOperand::getImm(), llvm::MCInst::getOperand(), llvm::RISCVFenceField::I, llvm::RISCVFenceField::O, llvm::RISCVFenceField::R, and llvm::RISCVFenceField::W.
Definition at line 109 of file RISCVInstPrinter.cpp. References llvm::MCOperand::getImm(), llvm::MCInst::getOperand(), and llvm::RISCVFPRndMode::roundingModeToString(). Definition at line 42 of file RISCVInstPrinter.cpp. 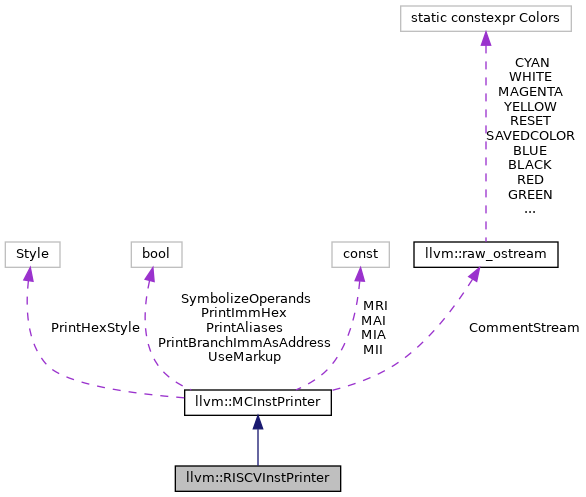 References MI, llvm::MCInstPrinter::MRI, NoAliases, printAliasInstr(), llvm::MCInstPrinter::printAnnotation(), and printInstruction(). Definition at line 60 of file RISCVInstPrinter.cpp. References assert(), llvm::MCOperand::getExpr(), llvm::MCOperand::getImm(), llvm::MCInst::getOperand(), llvm::MCOperand::getReg(), llvm::MCOperand::isExpr(), llvm::MCOperand::isImm(), llvm::MCOperand::isReg(), llvm::MCInstPrinter::MAI, llvm::MCExpr::print(), and printRegName(). Definition at line 56 of file RISCVInstPrinter.cpp. Referenced by printOperand(), and RISCVInstPrinter().